Just last week I was waxing on about the benefits of a well-stocked knitting library, including fabulous reference books, and lo and behold earlier this week a few new things arrived in my book review mailbox. I’m trying very hard not to just hang onto every single book I receive – which can be a challenge, let me tell you, because a lot of them are really awesome – but this one, this one is too great not to give away. I had a lot of fun looking through this little gem, Cast On, Bind Off by Leslie Ann Bestor. This is a neat little book and I’d be happy to pass it on to one of you dear readers. If you’d like to be entered to win this book, leave a comment here some time before Monday morning telling me what your current favourite cast-on or bind-off method is, and why! Whether it’s one you just learned or one you’ve been using for years. I’ll post the winner Monday afternoon. In the mean time, I’m happy to have some new projects to work away on this weekend, including the striped Turtlepurl socks I started a couple of days ago. I think I’ve just about gotten to the end of an entire striping sequence and can tell now what the colour progression will be. They’ll be fun socks to wear so I’m going to do my best not to let them sit idle for too long, lest they go unknitted and sit in my blind spot in favour of newer things. Fall is coming, after all, and a gal can always use more socks. 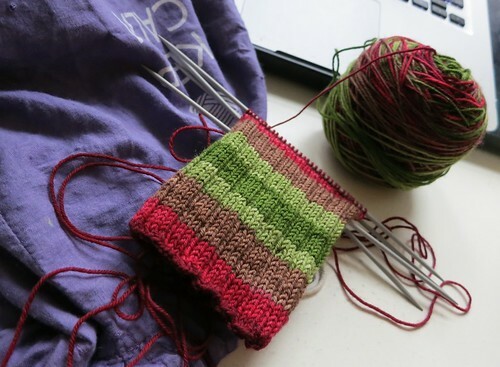 I love the long tail cast on which I was for some reason reluctant to learn and now I use it all the time – I love the stretchy edge it gives to cuff down socks! I have to admit, I haveused the long tail caston for many years regardless of what a pattern called for. Recently I have started using the knitted cast on which I am now completly in love with. No more guessing how much yarn to use! I still use the classics- long tail cast on all the way! Thanks so much for such an awesome give-away. I have only used long-tail, cable, and simple backward loop cast-ons, but realize that I could use some more techniques. I have tried only 3 types of bind-off techniques and frankly, did not know there were so many others. I use my own version of a long tail cast on. I figured out how to knit when I was 10 and had to figure out how to get the stitches got on the needle. It’s similar to the long tail cast on but slightly different. After years of using the knitted cast on I’m currently a big fan of the long tail cast on…. if only I could master exactly how much yarn to use! I like Judy’s magic for socks. I haven’t found a favorite bind off yet, I dont know many and am not happy with the simplistic ones I know so this book is becoming a must have in my mind. I always use long tail cast on even though I do not really like it in some situations. I could use this book to explore some new cast ons! I actually am commenting because I would like to know specifically which yarn you are using for those great striped socks, but while I’m here I would also love to win a book to teach me casting on and binding off! 🙂 I currently use a long tail cast on and whatever bind off it is that has one pull the second to last stitch over the most recent. I use those because that’s all I know. …see, I would clearly benefit from the book! I just placed a hold for this book at the library – I would love to have your copy come live with me though! I’m still a very new knitter and only know the long tail cast on and I don’t know the name for my cast off! This would be an awesome book for me and if I can’t win it I’ll have to buy it I think! I used the cable (knitted) cast-on method faithfully for about 30 years. Then I learned the long-tail cast-on and have used it faithfully for about the last two years as I, too, am sock-obsessed. Recently, though, I was asked to teach some friends the crocheted cast-on, and I have to say that that is a pretty swell method, too. Thanks for offering the book! I grew very fond of the Italian Tubular cast on method after making a pair of Eunny’s Endpaper Mitts. I’ve used that cast on ever since for top down socks. It makes an extra stretchy cast on that doesn’t bind the way that many can at exactly the wrong point of your calf. Boring I know, but the long tail cast on is my “go to” cast on. I also like the provisional cast on when i need live stitches, and have just learned to do Judy’s Magic cast on. I am usually a knitted cast on girl and if possible i cast off by knitting through the back loop of the first stitch, putting that back on the left needle and knitting 2 together, and then repeating. I would so love this book. I know because I have a copy borrowed from my public library right here. I was originally taught the backward loop cast-on, but I vary among the long-tail and cable cast-ons, depending on what work I’m doing, and my favourite cast-off is one that Lucy Neatby taught me, but I’m not sure what it’s called. I usually use the long-tail cast on, just learned the cable co and like it though. For toe up socks I use the turkish co. Thank you I would love a chance to learn more this book looks great! Love the socks! Nice colors to wear this fall and winter. My favorite cast on is the knitted cast on. It is great for my socks which gives a nice stretchy cuff for me. The long-tail cast on is always my go-to cast on if the pattern doesn’t specify. I’d love to learn about some new ones! I was getting a bit notorious for my super-long tails when I used a long tail cast-on, but I learned the knitted cast-on lately & that solves that problem entirely. My Mum taught me the cable cast-on when I was 8 (ok, she cast on for me but eventually I learnt) and for years that was all I used, I really like the rolly scallopped edge it gives. Then I discovered the long tail cast-on and, more recently, the German cast-on which is long-tail but leaves the stitch looking like a purl rather than a knit. Just this week I leartn the crochet cast-on, it’s super neat for top-down sweaters with raw edge necklines. I’m a fan of the Old Norwegian cast on. It’s easy once you get the hang of it, but looks complicated, so my inner show-off gets to play. Plus it’s nicely stretchy for hats, socks and other stretchy things. I almost always use the long tail cast on, but it’s never too late to learn something new!! This book looks like it would be a great reference tool. I have been using the cable cast on, becaise it is not as loose as the long tail cast on, and looks just the only bind off I know. I just learned the Norwegian cast on so I’ve been using that lately. I use the long tail cast on knitting cast on. I have to admit I haven’t tried many others. I would love to. Sometimes I feel my cast on hasn’t been appropriate for the item I’m knitting. So, this book would really be helpful!! My favorite bind-off? I don’t know it’s name, but you knit one through the back loop, *return it to the lefthand needle and then knit two together through the back loop* repeat. Looks even and it’s stretchy! My favorite cast off right ow is Jenys Surprisingly Stretchy Bindoff. I think it’s wonderful. Thanks for the chance to win the book! I use the long tail cast-on for just about everything… and I just cast-off normally. I would love to learn more ways to do both! I love your socks… the stripes look wonderful. I like the long-tail cast on, mostly because it is the only know I use. The long tail cast on has always been a standby, but I also have a strong fondness for a cable cast on now and again (I like the edge it gives for hats, in particular). Bind offs are usually sewn for me to give a bit more stretch, I’m a pretty snug knitter overall. I am on a reference book reading kick right now so my brain would be more than happy to expand it’s knowledge base quite bit more. I always used to do the knitted cast-on no matter what, but recently realized it gives the edge a funny loopy look. Right now I really like the backwards loop. I have used the long tail cast on for many, many years. Since I’m still kinda new, I only know the long-tail cast-on and I have no idea what the name is for the bind-off, just a bind-off…although I did just learn Judy’s Magic loop for toe-ups…so this book would be such an awesome reference…and OMG I need that yarn! I always use a long tail cast on for most things. I only recently learned about Judy’s magic cast. Thanks for the opportunity to win a gret reference book! I use long tail cast on because it’s the way I was taught by family, I’ve never tried any other way but I would love to learn new methods. I’ve only been knitting for a few years and have become comfortable with my methods that I haven’t tried to learn more. I never knew there were so many options, it’s slightly overwhelming to think of. I use a knitted cast on that I learned over 30 years ago when I started to knit, so I would like to win this book because having other techniques in your toolbox is always good! Thanks for this giveaway! I use the long-tail cast on whenever possible, but I’ve just discovered Jenny’s surprisingly stretchy bind off and I love it, especially for toe-up socks. Nice review 🙂 I love those socks you’re working on. Is that just your basic ribbed pattern? It looks great with the yarn! I use a long tail bind off, because that’s the only one I actually know. I think I’m ready to expand my horizons though. Thanks for the interesting review and the giveaway! Cast on and bind off are techniques that can turn a good knit in a total success or failure… So it’s nice to have options and pick what fits your project. This book seems very useful in that regard. My to-go cast on is the long tail one and Jeny’s stretchy bind-off is my favorite bind-off technique; I would use those when the pattern doesn’t state otherwise. My favourite is the twisted German cast on, as I’ve knitted more socks than anything else! I’m also really loving the cable cast on as I knit more garments. I use cable cast on most of the time, as that is what my mom taught me way back when. I’d really like to start trying more, and I could really use the help with choosing the right cast offs, that is always a challenge for me. Thanks! I have switched to the Norwegian cast-on – at least, I think that’s the name. I learned it from a Lucy Neatby You Tube video and I love it. I also changed my BO to as SSK type cast of. IT is fascinating to learn new techniques after so many years of doing the same thing. This book is on my wishlist! I like to use the long tail cast on method for it’s flexibility. When it comes to casting off I don’t have a favorite and usually follow the method suggested by a pattern. I recently learned a super stretchy cast off that has come in handy. I always use a long-tail cast on. I haven’t tried anything else. Same goes with binding off – I just use a simple bind off. It’s all I know. I saw this book on Pinterest the other day and have been wanting it ever since… what a great resource! Thanks for the chance to win. I often use long-tail cast-on but lately I have been loving the twisted german cast-on for socks. Even though I’ve been knitting for 10 years I just had cause to learn the sewn bind off this year. I was amazed that it made a neck hole on a baby sweater flexible enough to fit over my adult head without being misshapen! When I first learned to knit I was taught the knitted cast-on, now I use the long-tail cast-on which is great for just about everything. Just learned the i-cord bind-off and it is so cool to add textural detail on the edge. I got the Kindle version of this and I love it! It’s such a great book. I think to myself “hmm… I need a stretchy bind off, which would be best” and the book will tell me. 🙂 My current favorite bind off is the one where you k2tog, then put the stitch back on the left needle and repeat. Cute, stretchy, and a little decorative. I’m a little sad that Kindle = black and white, so I would love the IRL version of this book. Long-tail cast on because its the first thing I learned. I typically do a sewn bind-off because I like how stretchy it is but I’m a sucker for kitchener stitch. No idea why, it just makes me happy. I learned how to to the long-tail cast on when I first started knitting and go back to it all the fime. I’ve tried others, but this is the neatest to me. I always use long tail cast on for a nice stretchy sock cuff. After your blog post I realized that my knitting library needs some new additions and this book would be a great one! Long-tail cast on, this is the first one I learned; have wanted to learn others, especially Judy’s Magic Loop for socks but haven’t done yet. Thanks for a great giveaway! I really only do long tail cast on. I recently made toe up socks and watched a you tube video 4 times to get the cast on right. Only use the plain old cast off as well. Would love to see all the book has to offer. The stripes on the socks look awesome! As for cast-on’s, I’ve been using the long-tail method for years. It’s the second one I learned and my go-to for just about anything. However I sometimes use the knitted cast on if I need different edge characteristics. Bind off is always the same way, a simple knitted bind off. That book seems like a great way to check out different ways of doing things and seems like a great resource. I have two different cast on methods that I use, and they serve me very well. (Long-tail and what I call the ‘bunny-hop’ cast on because I have no idea what it’s really called, but my fingers look like bunny ears when I do it) However, my cast-offs are horribly tight, and often make my knitting suffer. I love the Russian cast-on (similar to Judy’s magic cast on). But I love learning new techniques while I knit, so this book would be great! Up until recently, I only knew one cast on method…. I don’t even know what it’s called. But it involves two needles and a fairly inelastic edge. I used it for years. Then I learned Judy’s magic cast on for socks, and the long-tail cast on…. now I’m on a roll. Love long tailed cast on which STILL reminds me of the string game Cat’s Cradle! Not sure how much to pull out? Just use one end from the center of the cake and the other from the outside, slip knot them together for your starter stitch and voila! Two tails that let you cast on zillions -cut the one you don’t want when you’re done casting on and GO! Nothing compares to Judy’s magic cast on for toe up socks. Otherwise I tend to use a long tail cast on. When I first learnt to knit, it was using the knitted cast on which gave me very sloppy edges. When I came back to knitting, I learnt the cable cast on and the alternate cable for ribbing and then the long tail and I keep learning and learning. My current favourite is the combo of Judy’s Magic Cast On with Jeni’s Surprisingly Stretchy Bind Off for toe-up socks. You have no idea how much I need this book – so many projects get skipped by me because I don’t know how to do anything more than the long tail cast on and a simple bind off of k2, slst… this book would definitely open up a world of possibilities for my crafting world. Looks like long tail cast on is the standard….I too use long tail cast on. Lovely stretchy edge, stitches look finished and even. Only problem is I sometimes have to cast on more than once as its difficult to guess how long the tail really should be for a large number of cast on stitches. These days, I’m most often using a suspended bind off that I learned from JC Briar in a class she taught at Black Sheep a couple of years ago. Ahh, how i would love to have that book..especially since I know theoretically that other cast on types do exists I almost exclusively use only the long tail one…that is what my grandma thaught me about 40 years ago, that is what my mom used… so I am really wishing for this book now. This book looks very handy! 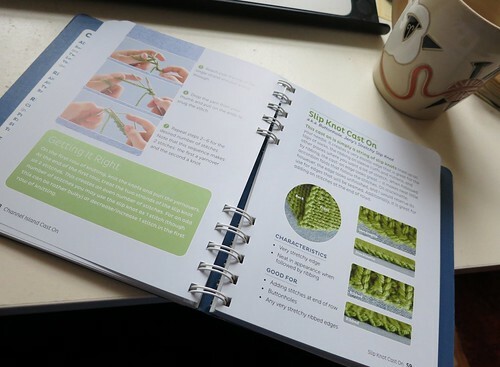 The spiral-bound format is such a help, too — I like being able to have the book STAY open while I’m trying to follow instructions, as opposed to setting up a paperweight system or wrangling it onto my cookbook stand. I never really mastered the long tail cast-on, so I used a knitted cast-on for many years. Then someone taught me a cable cast-on, and I have use it most of the time. My new trick is an i-cord bind off. It looks so pretty. I too use the cable cast on, but would really love to try something new and different, my problem is that I am usually so anxious to get started a on new project, and see how it is shaping up that I stick to what is familiar to start off, but I am open to try new cast on’s and cast offs. Moira C.
thank you, thank you, thank you for another chance to win. i really need this book. as for my favorite cast on i have always used the cable cast on. i need this book so i can finally learn how to do the long tail cast on. loving the progress on the socks. I still use the long tail cast on…I’m trying to break that habit and use the knit on one. I’d love to learn other ways to cast on and bind off. I just learned a new way to bind off — don’t know what it’s called, but you knit one, slide it back to the left needle and k2 together, slide that back to the left needle and k2 together — kind of a cool edge. I’ve always just done the long tail cast on it’s all I know. I would love to learn more. That book sounds perfect! I love the long-tail cast on. I learned it when I was first learning to knit and it’s my default. I love how it is pretty and stretchy. I don’t have a good bind-off, though. I am a super newbie at knitting so I only know the basic knit to cast on:) can’t wait to learn some new tricks!!!! My favourite cast on has to a modified version of the backwards loop…because I just cannot figure out Judy’s Magic Cast On, no matter how many times I try! This book looks like a superb resource! I use both the long tail and the cable cast on, depending on the project and how stretchy it needs to be. I almost always use the old k1 pass last stitch over for casting off; but I bet I’d find a new fav in that book! I recently learned the German cast on. It’s nice and stretchy–great for top down socks and for hats. This will help me learn some new ways to cast on. I keep seeing it and it seems like a terrific addition to my library. I really don’t know very many different methods so I really don’t have a favorite. A book like this would be very helpful. Thanks for the opportunity to win one. I have just learned tubular cast on for ribbed edges and I am in love with it. It takes a bit more time to do your set up but the edges just look so professional when you’re done. Honestly, I didn’t know there WERE other ways besides long-tail cast on and standard ‘knit one, knit two, pass first loop over’ until about a year ago. Now I can’t wait to learn a bunch! Even if I don’t win, I expect I would want to purchase this book. Has it been published yet? I like the long tail cast on the best. Although Judy’s magic cast-on is awfully handy as well! My favorite caston is the crocheted caston, but the long tail has always been my best standby. My favorite cast on is ther knitted cast on. I think it makes such a nice, finished edge. I’d love to get my hands on this book for a good cast off. I really don’t have one that I love. Just recently I learned the “surprisingly stretchy” bind-off: you do a yarn-over before knitting the stitch, which you then pull over the knit stitch before the previous stitch. If that makes any sense. It really is very stretchy! I love Jenny’s surprisingly stretchy bind off and use it more than any other. But I am excited to try an i-cord bind-off with the abalone I am working on now. I think it’s always good to have a variety of cast-ons and bind-offs in your arsenal of knitting tricks. I prefer to knit cuff-down socks, but I’ve recently finished a pair of toe-up and worked with Judy’s magic cast-on. I like long-tail for most instances though. I like 3-needle bind off and Jenny’s surprisingly stretchy bind off. I’ve had my eye on this book, and I think it’s even on my amazon wishlist! I tend to do a longtail cast on because that’s what I learned first! I like cable cast ons too though! Would love this book. After 50 years of the same old casting on I think it’s about time for me to learn something new. As to binding off…OMG…there’s more than one way????? Stunned! I tend to default to standard long-tail cast-on! Long-tail! It’s nice-looking, versatile, not too stretchy, not too tight. I use the long tail cast on because that is the one I know…I love the three needle bind off, not sure why I just enjoy the technique! I always use a knitted cast on but have read a bunch lately about how different methods create different results. I think I really need this book to expand my horizons!! I generally use a knitted cast-on but find the long tail cast on with two balls of yarn to be pretty nifty (You don’t have to worry about how long a tail you need). Long-tail cast on is my fave, although I’ve done others when the pattern calls for it. Not sure I could name any cast-offs besides the classic knit 2, bind off 1! The Old Norwegian cast on is my favorite for socks, because it is very stretchy. I learned this cast on from a book. I grew up doing the knitted cast on and thought that was the only way. Then I learned the long tail cast on and stuck with that until a pattern called for a cable cast on and I had to scramble to find out what that was after trying, unsuccessfully, to use the long tail cast on, anyway! Now, I think my favorite cast on is the one that works best for the project I’m currently knitting! Love how your socks are coming out. My favourite cast-on is Judy’s magic cast-on – I love how I can start socks from pretty much nothing and make a seamless toe. I really need to find a similarly awesome cast-on for cuff down socks. I don’t knit socks that often, but I love the Twisted German Cast On when I do! I’ve only been knitting for about 2 years, so I only know 1 cast-on, and 1 cast-off!! I REALLY NEED THIS BOOK!! It’s a wonderful give-away; thanks! After reading everyones posts I realise its my bind offs I need to develop, if its not kitchener stitch I use the knit until you have 2 stitches on your right needle, pass right stitch over left and off the needle and repeat. I have never had a name for it. To cast on I favour the long tail as its so quick, but this is a recent thing, since I was brought up on the cable cast on. I finally learned the long-tail cast-on a few months ago and it’s become my go-to cast-on for most projects now; it’s so much nicer than backwards-loop! However I’m finding that it’s *not* the perfect cast-on for everything…I definitely need to learn a few more. I’d love to win this book! I have been using the cable cast on more and more and I know it takes a little time to cast on but has a beautiful edge and nice and stretchy. I usually use a long tail cast on, but if I need a provisional, will use a crochet chain. For cast off on ribbing Jenys Surprisingly Stretchy Bindoff is great! I almost always use a long tail cast on. I would love to learn to love a few different ones! I just learned the channel island cast on, and like it quite a bit! My go-to cast on is usually long tail, but I do use others when needed. This book looks very helpful! I am a big fan of the long tail cast on because it is really quick. I just learned the provisional cast on for some snow boarding hats with earflaps for my son. I usually use a long tail cast on. I really like the stretchy ssk bind off and the invisible sewn bind off. Sadly I only really know the one cast on and bind off. I do the long-tail cast on (though I’ve tought myself Judy’s magic cast on but haven’t used it enough to be a favorite) and just the normal bind-off…I don’t even know what it’s called. Thanks for the giveaway! I’ve recently learned the tubular bind off, and it’s become one of my favourites because it works so well with ribbing. the long tail cast-on’s been the only one i’ve learned so far, and has been very good to me! my binding-off’s very basic too, i usually just go with the pattern, making sure it’s stretchy. Since I mostly knit socks, my favorite cast on is Judy’s Magic Cast on. However, if I am doing any other kind of knitting, I usually go for the long tail cast on. Well.. as I know only one way to bind off… and three ways to cast on.. knit, long tail and thumb… I NEED this book… My LIFE is lacking OPTIONS PEOPLE! Would be so happy to receive this… so happy… I might buy on too! I think I’ve only ever used what I’m guessing is the knit cast on, but it does the trick. I’d love to win this book so I can see what all the other options are & learn some variety! It depends on the project, I guess. I use the Twisted German CO when I don’t have strong feelings about the CO, but I love the usefulness of Judy’s Magic CO. It works perfectly for toe-up socks, tubular starts to ribbing, turned hems, or anytime you just want to come back and decide later! I’m sure there are other tricks like that, so I would love win this awesome-sounding book! My favorite bind-off is Jeny’s Surprizingly stretchy bind-off. I tend to be a tight knitter, so this has become my go-to bind-off. I reviewed this book on my blog from an e-arc and I loved it, but the arc expired 😦 I would love an actual copy of this one. Wonderful giveaway, thank you. Cast on depends upon the project…but when it isn’t specified I usually go for long tail. My favorite cast-off is k2tog, slip back onto left needle, repeat. Need to learn more cast offs though, so this book would be very useful! Oh random number generator – please pick me!! I like provisional cast on. It’s something I learned recently. Looks like a great book! I’ve just discovered the interlock bind off. It’s made of genius. i almost always use a cable cast-on and purl2tog bind-off. they seem to work the best for me. I tend to stick to long tail just because it is easy, but I really should learn a few more cast-ons….To cast off, k2 together through the back loop is super speedy, but not always the most effective…..so yeah, I need to up my game! I like the crochet cast on. It would love to learn more. I just learned the surprisingly stretchy cast on, which has been a huge help for socks. I have to admit, after many years of preferring the cable cast-on, I am a renewed convert to the long-tail cast-on. It looks especially clean and fabulous with ribbing, and it’s just stretchy enough to be functional without losing its shape. I use the long-tail cast-on the most and it’s probably my favorite because it’s so versatile. Thanks for the chance to win! My favorite is the tubular cast on, even though I’ve never tried it! I’ve always loved the way it looks. No funky cast on stitches. It’s super cool. Thanks for the opportunity!!! Awesome socks and fantabulous sheepy coffee mug!!! I like the cable cast on for clothing because it gives a nice, firm, attractive edge to the fabric. I recently learned how to do long-tail cast on, which is fab for accessories as it has a bit more s-t-r-e-t-c-h. I can’t remember how to do it without looking at pictures with instructions, but I tried the suspended bind-off for a shawl and I liked that – it gives a really stretchy edge so that you can block things out how you want them. I wish I knew more – my repertoire is a bit limited! I’m a long tail fan personally, but am getting better at cabled cast on. I really want to learn more though! I have just learned how to do the super stretchy bind off which is great for necks – I have at least one hand knitted jumper that I struggle to get over my head! Judy’s magic cast on for socks-it really is like magic! Almost always long tail, but knitted for some things. Those are lovely socks! I like the long tail cast on, because its the only one I know how to do. My absolute favorite is Judy’s Magic Cast On. If I can’t use that, I do long tail but really want to branch out. Those socks look amazing. Such great colors! Currently, my go to CO is the knit cast on and the normal bind off where you pass the previous stitch over the just knit stitch. I really need to try more out and would love the opportunity to use this book. My default cast-on is the long-tail; binding off I usually do the regular way, but I love Elizabeth Zimmermann’s sewn bind-off for lovely stretchy (but not loose and floppy) edges in garter stitch. My current favorite cast on is a provisional one. That way both ends of what I’m making can have the same bind off and match. Otherwise, my cast on edge is way tighter than my bind off edge. I find I really love the look of a properly executed cabled cast on because the ribbing will just melt into it and it almost looks like there is no cast on. I’m a fan of EZ’s sewn bind off. It makes a very neat edge and is so simple that I don’t have to look it up everytime I need to bind off. I usually use the Long Tail Caston, but I tend to use each end from the yarn ball, so I don’t have to guess the length of my tail, & that works all the time! However, I have yet to find a BO that I like, so this book sounds would fit the bill!! I always use the knitted cast on (I think that’s what it’s called) to cast on for socks. I find it just the right balance of stretchy and firm. When I started doing it, I didn’t know what it was. I was thrilled when I found out I wasn’t making things up. Looks like a great book. My Grandmother taught me how to do the long tail cast on so that is what I use unless I need Judy’s Magic cast on or a provisional cast on. I generally do the common knit one, pass a stitch over to bind off but did experiment with a stretchy bind off suggested by Paula of the Knitting Pipeline podcast. Thanks for a well written blog. I survived for too many years on a single cast on and bind off. So looking forward to expanding my vocabulary. I use the classic long tail cast on, it’s what I was taught when I first learned to knit and I always go back to it. Thanks for a great giveaway! I am loving the rib cast – on that I stumbled upon with my latest project. It is a beautiful brioche cardigan for my husband and the rib cast-on is contributing greatly to how well the garment holds it’s shape and have good ease at the wrists. That little book looks like a fabulous find, would enjoy if I’m the lucky one. I love Jeny’s Surprisingly Stretchy Bind Off as it is perfect for casting off a pair of toe up socks (my preferred method) and truly lives up to it’s name. I still mainly use the long tail cast on as it is so fast, but will use a knitted cast on when I need to do a large amount of stitches as for a sweater. The sock colorway you are using rocks! I was moved to check out Turtlepurl for myself and purchased her Striping Snow White colorway. I’m thinking they would make great Jaywalkers. I’d love to enter – looks like a really useful book. My favourite cast-on is still the long-tail, though I do it a little differently than most people, by looping yarn around my left thumb and forefinger. People always comment on how strange it looks when they see me do it. I love the crochet cast on. It gives a nice looking edge and no wondering how much yarn to start with! For most knitting I use the long-tail cast on. I use the stretchy k2tog bind off for most things. I only know two cast ons – the knitted on and the long tail cast on. I’m using the long tail cast on more these days. Really keen to learn more cast-ons for different patterns! My favorite is the cable cast on…I love how nice it looks. The all time go to is the long tail. I’m looking forward to learn more methods. This book would help. Thanks for the opportunity! For most of my knitting life I only knew one cast on method… The backward loop cast on. I didn’t even know what it was called until a recent pattern called for it (by it ‘s actual name). For the past four years I’ve been using the knitting cast on… Although I don’t even know it’s official name! I can’t believe there are that many methods. I have so much to learn which is so wonderful! I mostly use the Twisted German Cast-On; I like it because it is stretchy. I’m an old fashioned knitter, use the long tail cast on and the k2tog, slip stitch back onto the needle and repeat (don’t know the name) If I had the book I could learn some new ways to do this. long tail for the start and backward loop in the middle. They are easy and what I know so that is why I like them. For casting of simple knitted or purled depending on the stitch. I follow with the pattern. If ribbed I keep on keeping on. My usual is long tail cast on, but I now have Judy’s magic cast on memorized for starting toe-up socks. I have learned a super stretchy sewn cast off but I would LOVE to have a book with other options. I take it there are more than 2 ways to CO & BO?? I should really *stretch* my knitting skills more. The long tail cast-on has been my default but I also really like the crochet cast-on either for a provisional or regular cast-on. It would be great to learn both new CO and BO methods from this book. Thanks for the give-away! Favorite cast-ons: Turkish for toe-up socks, German twisted for top-down socks. Favorite bind-off: it’s gotta be the Surprisingly Stretchy one. Love tubular for the way it looks, but I always worry it won’t be stretchy enough. My favorite cast on is the cable cast on. I don’t run out of yarn before I’m done, and it has a nice looking edge. Even so, I’d love to see that book! I usually stick with my tried & true cable cast on, however, this week I started the Fiddlehead mittens & was challenged to learn the I-cord cast on – very neat! You can teach an old dog new tricks! I like EZ’s stretchy sewn bind off for stretchy toe up sock edges. This book looks amazing! Thanks for reviewing it. Ive had a thing for circular shawls and blankets lately so I’ve been loving Emily Ocker’s cast on. I can’t wait for winter when I’m sure I’ll use it all the time for top down hats. I like a cable cast on as I never guess right on the length of the tail! For socks, I like toe up, so I favor Judy’s magic cast on and EZ’s sewn bind off for stretchy cuffs. Is the book a pdf or is it the actual book? My favorite cast on is one of my recently learned cast-ons, the alternating cast for p2k2 ribbing. It is less bulky than a tubular cast on, but still gives a nice finish (or should I say ‘beginning’?) to an edge. My favorite bind-off at the moment is Jenny’s surprisingly stretchy cast-off, which I used on my last shawl. I like it because it really does allow the lace edge to s-t-r-e-t-c-h. I use a long tail cast on but also do it on needles that are two or three sizes larger than I will be using for the actual rib, I like the stretch that this gives me. I like the knit cast on. The woman who taught me to knit said it was the best way to learn the motions. I use long-tail when making socks, but all other projects get the knit cast on. I use the long tail cast on too, but I am very interested in learning other methods. My grandmother taught me the knitted cast on and it’s still my face–except for socks when I use long tail. I love Judy’s magic cast on. It use it for top down mittens and hats besides socks. I love the long tail cast on for just about everything and Judy’s magic cast on is my go to for toe up socks. I use the long tail cast on for everything unless the pattern calls for something else. I can do a knitted or cable cast on but I’ve never actually tried any others. I, like many others use the long tail cast on. But I have recently started using the knitted cast on which may be my new boyfriend! I really enjoy Judy’s magic cast on for toe up socks – seamless is fabulous! I have really enjoyed your sock color choices lately. Very fun. Almost finished with a stripey 3×1 rib of my own. I’m a long-tail cast-on girl myself, it always looks good and is fun to do! I have to admit I haven’t really tried many cast-off methods, which is one of the reasons I’m interested in this book. I learned the long tail cast-on in a class, a few years ago. I would like to try something different. Would love a chance! I love the long tail cast on! I have used others for different purposes but this is definitely my favorite. I would love to have a reference though for the many other options of cast ons and bind offs! I like the long tail cast on for most projects. I have recently learned provisional cast on. It’s great for a clean 3 needle bind off. However, I learned that one should never attempt a 3 needle bind off while under the influence of anaesthetic. I failed at a 3 needle bind off after coming home from a dental procedure. I was so focussed on knitting the stitches together that I forgot to do the bind off. When I looked at my needle, the stitches were still on it so I just pulled my needle off causing everything to unravel. Thankfully, the project was small so I just started over. I actually have this book checked out of the library and would love my own copy! I use the long tail cast on for just about everything. Lately, I have tried different cast ons for different things…provisional crochet cast on for a baby blanket with picot edges and a tubular cast on for a sweater. I use the German Twisted Cast On for most projects I like the way it looks and stretchiness. Knitted cast on user. Have wanted to take local class on different cast on and bind offs, but never got around to it. I think this book would be perfect! My recent favorite cast-on is the often aforementioned cable cast-on. I really like the edging it creates. After I have learned it (about 3 months ago) almost everything, except socks, was cast-on using it. Yep, I’m a cable cast-on fan also – looks so perfect,and gives me a nice, stretchy (but not too stretchy) edge for almost everything. No favorite cast-off, though . . . that’s why I need to win this book! Thanks for the contest. Cable Cast-On and Judy’s Magic Cast-On are my favourites, but I really need help in knowing different cast-offs and more of each. Awhile ago you reviewed a book by Margaret Radcliffe called “Circular Knitting Workshop”. I bought that book (love it!) and learned about using the tail to cast on so you don’t get that little ledge/jog happening…so now I have a nice smooth edge. Thanks for the contest. Wow, that’s a lot of responses! (That I didn’t just read through.) Have to admit, I more or less only know long tail at this point, and so far, other than being a little irritating to estimate length on, it has worked really well. More or less the same with casting off, just the basic knit/purl and slip the proceeding stitch over the current one — although I’m wondering if a 3-needle bind off counts as something else…. I only know how to do the long tail cast on and usually cast off by knitting the stitch and then pulling the previous stitch over. For a stretchy cast off I knit the stitch and then knit through the back loops. Long tail cast on is my favourite however, this is the only one so far I’m super good at. I struggled ALOT to learn it so, I think that’s why its the cast on I use the most. I love learning new techniques though and why there is so many different cast ons! I use a long tail cast on. It’s the first one I learned and I’ve just stuck with it in my short knitting career. Would love to have CAST ON, BIND OFF to teach me some new ways. Thanks for the opportunity. Ike to learn others…and when and WHY to use them appropriately. I really think that book needs to come live at my house! I saw this book in my lys and would love a copy! It looks so handy! My dear mother taught me how to knit when I was a wee girl of 8. In the half century since then I never knew there was any other then the long tail cast on. Since trolling on knitting blogs I have discovered knitting knowledge that is beyong my imagination. I would dearly love to discover new methods of cast on’s that I would then share with my now 80+ year old mom. I have only been knitting for about a month now so I only know 3 kinds of cast on techniques: long tail, two needle knit on, and the norwegian cast on. The norwegian cast on creates a stretchier cast on edge and it is so much fun to use. I have used it for many of my projects, such as my first pair of fingerless gloves and my first pair of socks. I would love to be able to learn as many different methods as possible to further my passion for knitting. Have been using Lace bind off (K2 tog tbl, transfer st to left needle) for a stretchier edge on shawls. Would love this book to find best cast on/bind off for any project. I just started knitting and learned how to cast on from my MIL. I have no idea what technique it is! 😦 I would love to use this book to expand my knowledge. Thanks for holding the drawing! Cable cast on looks good and is nice and stretchy too! Perfect for those of us with generous calves. My favorite cast-on is a variation of long-tail. I don’t know what it’s called, though I suspect it has one or more names. Essentially, each strand of yarn is worked on one of two needles, so it ends up with a stretchier edge than a regular long-tail by providing that extra space between stitches (wrapped around one of the needles) in a nice standardized way. It’s NOT a standard long-tail over two needles held together; this one separates each step of the long-tail over two different needles held together. A few years ago, a friend showed me the method of “Italian” casting on and off – it produces a beautiful rolled edge-type finish for sweaters and socks. What a gem of a resource. Thanks for posting the idea. I learned the ‘old norweigan’ cast-on not too long ago. It’s great for top-down socks — helpful since I had been making my edge slightly too tight or slightly too loose for a while, and the stretchiness of this one is just right. Sounds a little like a Goldilocks knitting story, but there you go. I’m teaching my widowed s-i-l to knit and would like to help her start a reference libray–this book looks great? I prefer the long tail cast on because it’s the only one I can do consistently and successfully without redoing it a million times! I use long tail and cable cast on quite a bit, and magic cast on for toe up socks. Cable cast on. I like being able to mess up in the first row and be able to recover without recasting on my stitches. favourite cast on right now is the bind off cast on using a crochet hook. I like it because I’ve crocheted for years so it’s familiar and, best of all, it matches the bind off edge. I’m not sure what the cast on I use is called but it’s one where you knit the stitch onto the needle. It makes such an even, pretty edge! I like the long tail cast on and also like to use the knitted cast on which I was taught as a child. I was raised on long-tail cast-on, and never knew until recently that there was anything else! It’s time to learn more. I love the long tail cast-on but do try to use the best cast on for the job. My current favourite for top down socks is Jeny’s suprisingly stretch cast-on. It was a pain to learn and perfect but definitely worth it for the finished results. Nothing beats long tail cast-on, though I’ve long been fascinated by tubular cast-on. Maybe someday I’ll learn! I made my first brioche project earlier this year, and have become enamored of casting off using a faux-brioch stitch– it’s really, really stretchy, and I think bears some resemblance to something written up in Knitty awhile back. As for cast-ons, I love my long-tail. My favourite cast on is the braided Latvian cast on, or the I-cord cast on (it’s a tie for me). I feel both these cast ons make pretty edges. Except for socks. Socks need a tubular cast on, because this cast on is awesome and stretchy. I still use the long tail cast on, that a neighbour taught me, when I was a teen. I cast off by knitting 2 stitches & then pulling the second over the first….not sure what that is called. Thanks for the chance to win a great book! Honestly, I use backward loop the most, but I would really love to be able to choose the edges depending on the project. My favorite cast on is the crochet cast on and my favorite bind off is the sewn bind off. Both are a bit fiddily, but I love the end results and more times then not I do not have to worry about them being too tight, like the other ones I try. I typically use long tail cast on…no particular reason, I just like it. 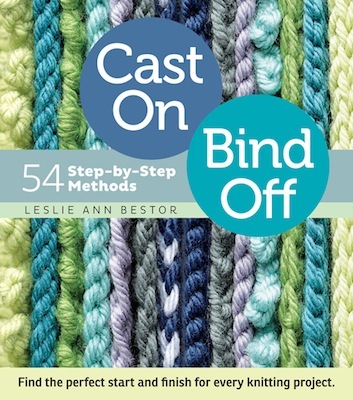 I’ve got a book that has lots of different cast ons and bind offs, but I find it really difficult to understand. This book looks awesome! I only know the basic cast on, but I do enjoy the difference between the normal cast on and the circular needle cast on. I started knitting 6 years ago, when i was 8, and have learnt so much with it. I feel I am an experienced enough knitter to own this book. It looks like an an amazing book! I just learned the tubular bind off. That was fun. I only know the long tail cast on…didn’t know there were so many cast-ons and bind offs! Your sock looks wonderful. Can’t wait to see it finished. i only know one method of each. casting on where you make a slip knot, knit a stitch, and slip it onto the first needle. binding off where you knit two stitches, and pull one over the other. Judy’s magic cast on is my latest favourite because it’s the one I learned last & it’s so tidy and useful! I use a cable cast on whenever I can. I like the rhythm I develop as I make my stitches. I always seem to use the long-tail cast on, and recently learned the stretchy cast off where you K2 together all the way around, slipping stitches back onto the first needle. I love how it’s stretchy, but still super simple! For myself I like the long tail cast on because I find that it is the best way for me to get an even cast on. wow, what an amazing giveaway! long tail cast on for me! Ooo I like your self-striping yarn. I wish here were more interesting choices like that for vegan knitters. Ok so, I still consider myself a beginner knitter and right now I have pretty much only taught myself two methods. The “knitting on” method of casting on is my favorite and so far I like it better then the long tail method. I feel like there is less “wasted” yarn, say if I made the yarn tail too long, all that extra would just have to be woven in or i’d have to cut a bit off. I greatly enjoy reading your blog and thank you for offering fun giveaways! I use the long tail cast on–besides being the only one I know well, I like the smooth look it gives to the edge. Like many I also just discovered Jenny’s Surprisingly Stretchy Cast Off. Alas with my current project and the interminable button band, I could most definitely use some casting inspiration! I find myself using the long-tail cast on more often than not, and love the Icelandic bind-off for its stretchiness and pretty edge. I use the long tail cast on and cast off normally. I don’t know any other ones so this book would be perfect! Is this book a pdf or is it the actual book? YES!!!! Would really like this book!!! I use Long tail most of the time, but I’d like to explore the more decorative ones. My favourite cast on is the cable cast on, but I would love to learn more!!! I use the long tail caston mostly, but I also like the crochet cast on. Thanks for the opportunity to win a copy of this book. I’d love to own a copy. As a novice I only really know the long tail & I’m not crazy about how it looks. Binding off – one way as well, in pattern. Thank you for this chance to win. I hope I’m not too late. The only cast on I know is the long-tail, which for the most part serves it purpose, but it would be nice to know others! My fave bind off at the moment is the Picot Bind-off – it’s just so darn pretty! I’m probably too late but I would love to win a book like this. Tubular. Am I too late? My favorite cast-ons would have to be cable cast on for places where there need to be stitches but where there were none before, such as underarm or ear-flap hats. Second the German twisted method for socks and hats since it leaves a nice soft and stretchy edge. Picot bind-off is indeed so darn pretty. I use the long tail cast on (with no slip knot) for most of my items, but really LOVE the tubular cast on, especially for 1 by 1 ribbing – that’s my total favorite, it’s just magic!